Excellent for fresh eating, salads and baked goods. Jonagolds also make great fried apples. Simply sauté in a little butter and add a little cinnamon.No sugar needed! The smell of fresh apple crisp wafting through the house is a sure sign of Fall. The Jonagold is a cross between the Jonathan apple, an old American variety discovered in the 1820’s, and the Golden Delicious apple. 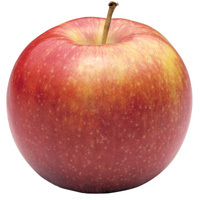 It was developed by the New York State Agricultural Experiment Station at Geneva, N.Y. in 1968, and has become a popular apple in both Europe and the United States. There are over 70 strains of the variety. The color of Jonagold is dependant on the strain and climate, and varies from pale green-gold with a faint red stripe to solid red. Jonagold is crisp, juicy and tangy-sweet, with the crackling tart flavor of Jona than and the so sweet taste of Golden Delicious. Considered a fall season Washington apple, Jonagold was also chosen by experts as one of the two most preferred dessert apples in the world. It is the variety of apple that is used in Cidre, a brand of cider by lager manufacturer, Stella Artois. Test the firmness of the apple by holding it in the palm of your hand.